You can create a new customer record at any time using the New Customer link in the Customers tab, if your administrator has granted the necessary privileges. While processing an interaction, Virtual Contact CenterA contact center that enables agents to be located in different geographical locations yet managed as if they were located in the same physical location. searches the Local CRM for existing matching data. In the absence of matching customer records, agents are prompted to enter a new record via screen pop. The following describes the use of the default customer fields. 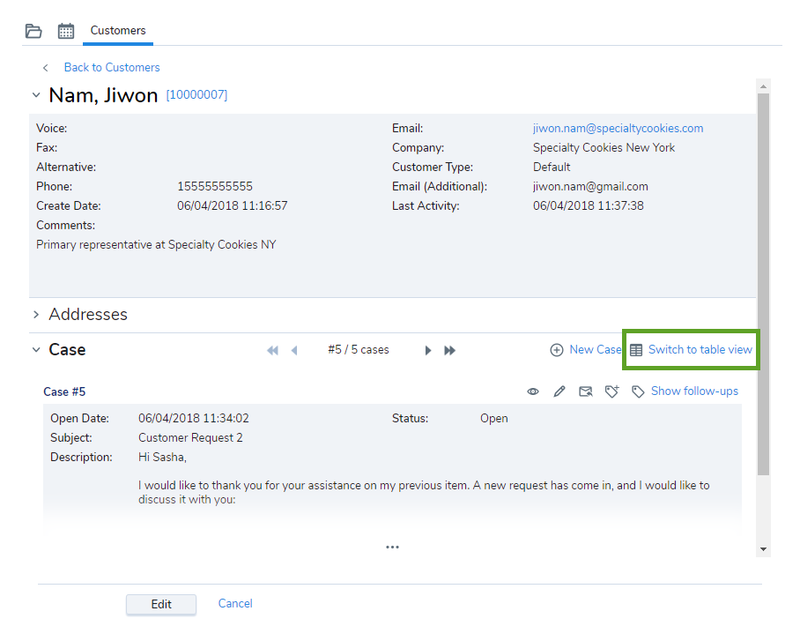 Depending on how your contact center administrator has configured your Local CRM, the customer creation tool may display additional customer fields. Click New Customer link in the Customers tab. Agent ConsoleVirtual Contact Center's browser-based graphical user interface (GUI) used by Agents to manage customer interactions. displays the Create New Customer page. Enter the customer's First Name and Last Name. You must specify the customer's name before you can save the new customer record. Enter the customer's Email address. Each customer email address must be unique. Agent Console uses the customer's email address to send the customer their optional Support CenterIn Configuration Manager, use the Support Center page to create customer-facing support Web page for your contact center, and specify the contact -- FAQs, desktop sharing, chat, email -- available from that page. access credentials. To prevent a single customer email address from receiving multiple Support Center access credentials, Agent Console uses the Local CRM to verify that each customer email address is unique. You can save email addresses that has up to 254 characters. Select Restrict customer's access to Support Center. To specify the customer's Support Center password yourself, type a password in the Password text entry area. To have Agent Console create the customer's Support Center password, select Generate password automatically. Note: When you save the new customer record, Agent Console sends the customer's Support Center access credentials to the email address specified in the Email text entry area. Enter the customer's address in the Primary Address and Secondary Address areas. Select to Save the customer or Save as Draft. After you create and save a customer record, you can edit the information or delete a customer record, provided that you have the permissions to delete and edit. Contact your Virtual Contact Center administrator to learn about your permissions. Click the Customers tab. A list of customers appears. 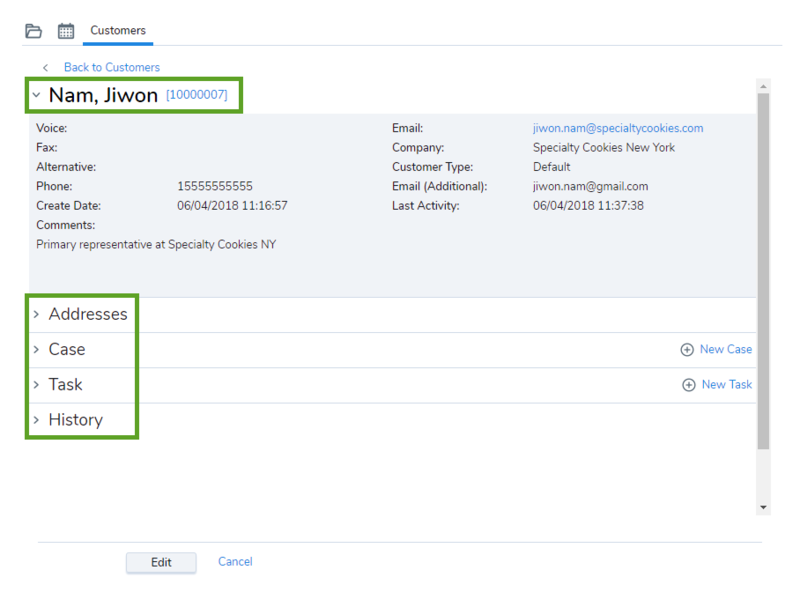 Click one of the actions items available to view or edit the customer record. 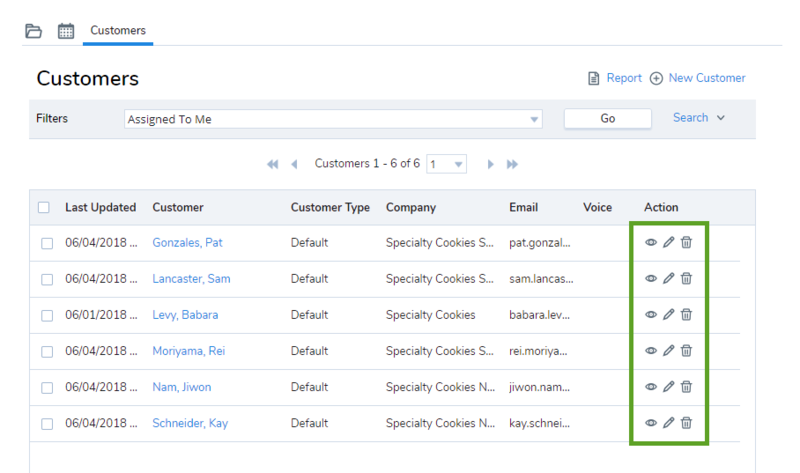 Select and open a customer record from the list, and then click Edit at the bottom of the page. When you open a customer record, you are able to view the customer details such as name and account number, as well as cases, tasks, and the history of changes made to the customer record. Details: Includes voice, email, company, phone, address, etc. The customer last name, first name, and account number appear as a link in title. Clicking Back to Customers takes you back to the customer list. Case: Includes the cases or records of interactions with the customers created during or after an interaction. You can view cases in Table view or Unitary view. 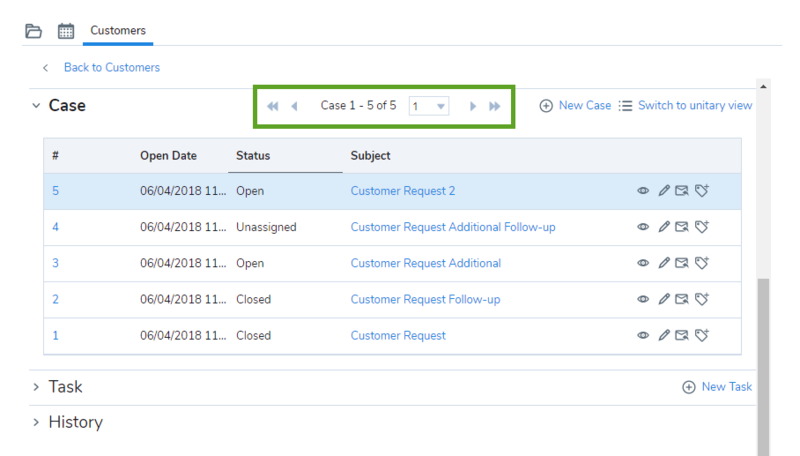 Table view lists all cases associated with the customer in a tabular format. Unitary view shows one case at a time, and can be navigated using the pagination tools. Table view is the default view when you first open cases. In Agent Console, go to the Customers tab. Select a customer, and go to Case to see the list of cases. Highlight a case from the list, and select Switch to unitary view. The case details display, and information in the To, CC, and BCC fields. Clicking View source allows you to see the email protocol routing. You can see one case at a time. Use the pagination tools to go to other cases. Click to see all content. Task: Includes tasks such as calls, emails, meetings, chats, or any other type of contact made with a customer. History: Includes the history of changes made to the customer record.